Ganesha ~ the elephant God ~ is a child of Shiva, the Supreme Being, and Parvati his wife. Also called Ganapati, Ganesha is one of the most popular Hindu Gods. His name means Lord of the Ganas, who were dwarf followers of Shiva. Lord Ganesha represents the call to spiritual power ~ he has been prayed to, worshipped and adored in one form or another since time began, as it is said that time began with his creation. 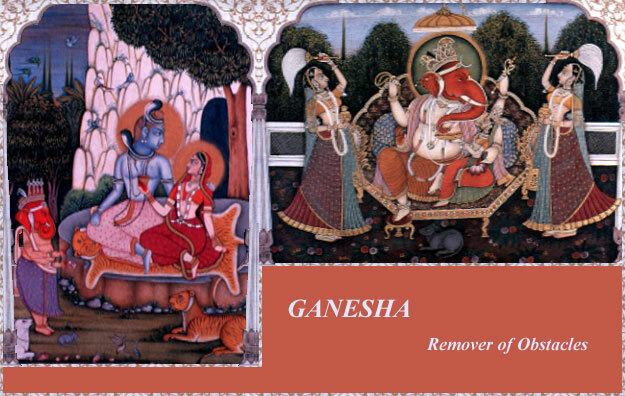 Ganesha's mother Parvati found him in her hand while wiping perspiration from her body after bathing. Indeed Ganesha was born with a corpulent body, said to contain within it all the matter of the universe. Soon after his birth he acquired his famous elephant head when the god Saturn ~ symbol of obstacles, difficulties, and delays ~ came to salute the newborn child. Saturn's powerful, fatal glance immediately reduced the head of the baby Ganesh to ashes. At once Vishnu, God of Love, set forth to look for another head, and returned with the head of Indra's elephant Airavata. The elephant head was placed without further ado on the shoulders of the young Ganesha. From then on Ganesha came to be called Vighnesa, who removes fear from the minds, or Lord of Obstacles, whose purpose is to help his worshippers surmount every difficulty. He is a jolly, good-natured god. Ganesha's four arms stand for his immense power in helping Humanity. Lord Ganesh is the Single-Tusk One, patron of literature, who tore off one of his tusks to scribe the great epic Mahabharata. Through this action Ganapati teaches us that knowledge and dharma are of utmost importance worth sacrificing even pride and beauty to attain. 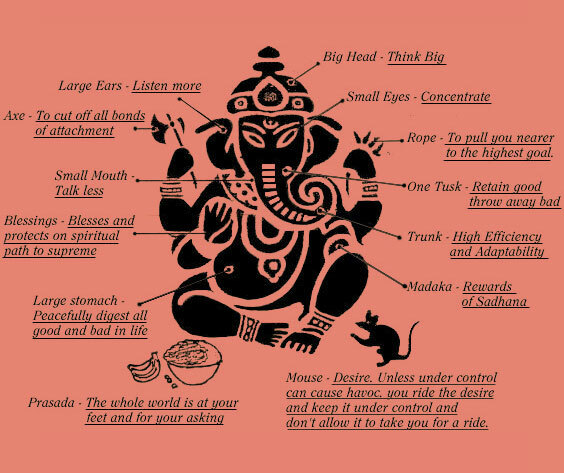 If you look at statues and imagery of Ganesha, there is frequently a tiny little rat (or mouse) at his feet, Mooshika, representing the worldly desires that need to be overcome. This being is known as Ganesh's "Vahana" or vehicle, and was basically used as a mode of transport after having been tamed by Ganesh. It is said that the contradiction between the heaviness of the elephant and the lightness of the rat is an illustration of Ganeshs role as one who brings about unity and harmony, and this is further demonstrated by the fact that Ganesh was able to tame a creature considered to be vermin. Ganesh enjoys adulation through constant repetition of his name. It is beneficial to purchase a statue of Ganesha and surround him with incense, flowers, and sweets. He especially adores chocolates. Above all, worship him often to remove the obstacles in your life. with so many ways to turn. as I lay all confusion at your feet and immerse myself solely in Your Being. Ganesha Chaturthi ~ the 10-day festival in honor of Ganesh's birthday ~ is celebrated in August / September (the date is variable, as it is based on the lunar calendar). Ganesh is said to bestow his blessing on all participants for the duration of the event. The Ganesha Chaturthi is an opportunity for rejoicings and parades where statues of Ganesh are exhibited in all localities where the festival is observed. The most famous of these festivities occurs in Mumbai (Bombay).